These have been on my list for a while but since I’m not the biggest chickpea fan I pushed it aside. But when I resolved to create a healthy trail mix this recipe sounded perfect. 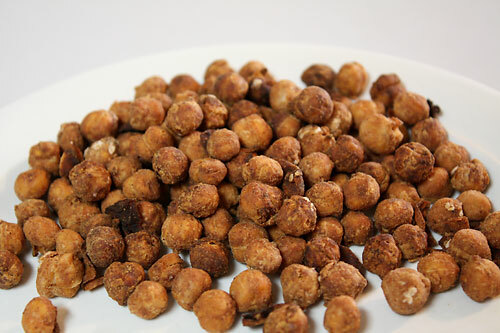 Roasted chickpeas are a perfect snack on their own and have an equivalent crunch to corn nuts. As a first attempt I used a mixture of seasonings but some spices (paprika) tend to burn and the overall taste was unimpressive, which led me to devise a much simpler version. If you have yet to be persuaded to try PB2 then this recipe alone should tip the scale, although any peanut flour will work. The peanut presence in this recipe is fairly mild but really enhances the overall flavor and tastes like an African-inspired snack. According to several sources, any bean can be used in this recipe but the cooking time will need to be adjusted (most likely increased). To control the sodium content of this recipe, use no-salt added beans. 1. Drain and rinse chickpeas in a colander until water runs clear. Let drain for 10-15 minutes until mostly dry. 2. Preheat oven to 375 and line a baking sheet with tinfoil and spray with cooking spray. Use a paper towel to further dry the chickpeas if they are still wet (a little moisture is fine). Place the chickpeas into a medium sized bowl and spray with cooking spray. Add PB2 powder and salt and toss to coat. 3. Spread chickpeas into one layer on the baking sheet and bake for 45-55 minutes, shaking the pan every 15 minutes. Watch them closely near the end so they don’t burn. Take one chickpea out at the 45 minute mark to test. They should be dry and crunchy with no moisture left inside. Uh, those look AMAZING! Thanks! Darn…I only have chocolate PB2. But I’m saving this recipe anyway =) FABULOUS idea! This seems like a good idea all around. Thanks for the recipe. sounds delicious…i want to taste it…gonna get the ingredients right away. Nick, these look amazing! Funny enough, I was coming to your website to tell you about a peanut butter idea I had for you: peanut butter hummus! Mind you, I just read you’re not a chickpea fan, but I’ve made it before and it’s absolutely delicious! I though you might appreciate it, since it certainly kicks up the ol’dip a couple of notches! Oooh, those look excellent. Too bad PB2 isn’t exactly easy to get without ordering it online. Can’t say I’ve seen peanut flour either, so alas, I’ll have to pass on trying it. What a great snack! Thanks. Nick, you’re right. They look delicious. Will you make me some next week? Can’t wait. What a fun way to use PB2! Oh wow, super yummy idea! These sound delicious. I love roasted chickpeas! I can’t wait to try them with your peanut flour spin. How delicious! Wow, I have to try these! I would have never thought to put these two things together. You are a genius! Awesome recipe… I’m a huge fan of PB2. This will be a great use for the 6 jars I have at home! Great way to enjoy chickpeas! LOVE these!! I SO want to try them. Never have seen low fat peanut flour, but I’m sure I can locate somewhere around here. I love roasted chickpeas. They add such a nice crunch to salads, but your trail mix idea is great too. Thanks Nick! I love roasted chickpeas! I’ve never tried this peanut butter stuff… sounds interesting! you’ve outdone yourself with that one, Nick. so making this asap, since I have all the ingredients at hand. I have seen roasted chickpea recipes all over it seems and darn it all, I’m going to try them. I’ve also wanted to try PB2, so this looks like a great way to do so! Wow! This sounds great! I haven’t heard of PB2 (please don’t throw anything at me!) but I have heard of roasted chickpeas and have wanted to try them. these sound great. I like regular roasted chickpeas, so I know I’ll love these too. I’m so glad the commissary has started to stock pb2 – now I have an excuse to buy it! Thanks! Fabulous idea! I’m so going to make these, and then claim them as one of my ‘five a day’. This is sounding pretty good to me. I always bake chickpeas in this way with spices as a snack but using peanut flour is a great idea. Do you add the PB2 straight in its powdered form, or do you mix it with water first? This is a great idea. I love roasted chickpeas, though they can be a little bland—and what a great use for PB2! THANK YOU! I have so many freaking cans of chickpeas just sitting in my cabinet for that homemade hummus I never got around to making. This sounds delicious! Oh sweet Lord, this is pure genius! I love chickpeas — I dump ’em outta the can, rinse ’em and eat ’em likeso — and I love peanuts. A-wait for it-mazing. Really? You eat them raw like that? I find them a bit too dry, despite being soaked in liquid. But roasted they rock, try it out! I WISHED I KNOW HOW TO COOK! um, a little embarrassed here: just made and ate a batch of these…Now I have to make another batch to add to the trail mix recipe that led me to this site.